Roots, fungi, and bacteria may team up to help some trees to clean polluted land, according to a new study. Fast-growing trees, such as willows, are known to tolerate and even rejuvenate soil contaminated with petroleum by-products or heavy metals. The clean-up of soil in this way is known as phytoremediation, a process is commonly attributed to “secondary metabolism”—the production of specialized compounds in plants that helps them cope with environmental stress. The new findings suggest that a more intricate symbiosis of microbial life underpins willows’ ability to thrive in these stressful conditions. Using advanced techniques for analyzing the simultaneous expression of genes from multiple organisms in an ecosystem, the scientists examined the roots of willows grown on a polluted site in suburban Montreal. 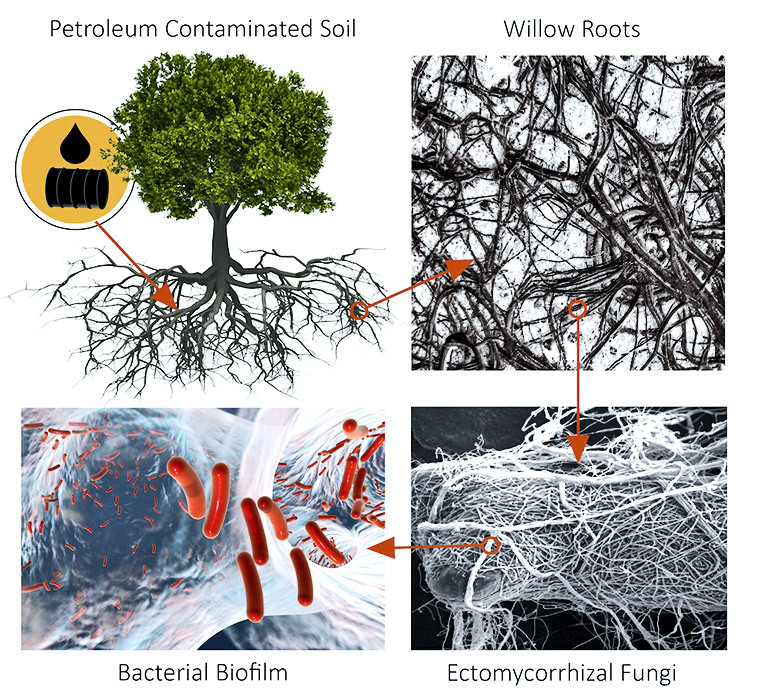 The researchers found that complex interactions among a range of ectomycorrhizal fungi—which form symbiotic sheaths around the roots of plants—and certain bacteria appeared to drive the degradation of hydrocarbons in the ground. “We normally approach genetics by limiting the investigation to single organisms or domains of life,” says Emmanuel Gonzalez, lead author of the study and bioinformatics specialist at the Canadian Centre for Computational Genomics at McGill University. “What was so surprising here was that, by looking for the genetics of all the life below-ground, the biological picture actually became easier to see. This also suggests that such complex mutualistic interactions may be the natural norm outside of the laboratory,” he says. The researchers report their findings in the journal Microbiome. Funding for the research came from Genome Canada, Génome Québec, the Natural Sciences and Engineering Research Council of Canada, BioFuelNet Canada, and Networks of Centres of Excellence of Canada.